The maestro of all maestros, AR Rahman, performing at the EagleBank Arena. FAIRFAX, Virginia, September 1, 2018 – For many Indians all over the world, he is the maestro of all maestros – A.R. Rahman, two-time Academy and Grammy Award-winning musical genius whose talent transcends borders and languages. And true to his awe-inspiring skill, he cast a spell on concert-goers in the Washington area. Well over 6,000 discerning listeners thronged to the EagleBank Arena, Friday evening, for a memorable concert presented by Vijay Taneja of Elite Bollywood Entertainment, the pioneer of such impeccably organized events in the national capital region. Rahman who is based in Chennai, Tamil Nadu, had announced that part of the proceeds will benefit victims of the massive floods in the neighboring state of Kerala. “Kerala, you are in our prayers. This too shall pass… be strong,” he tweeted. Accompanying the maestro on the ‘AR Rahman Live in Concert North America Tour’ were singers Udit Narayan, Javed Ali, Ranjit Barot, Neeti Mohan, Jonita Gandhi, Linda Lind, Haricharan and Mano, a remarkable ensemble of artistes whose performances were complemented by an outstanding orchestra. The Washington concert was fourth in the nine-city itinerary preceded by Oakland, Los Angeles and Atlanta. From here, the group heads to New York, Seattle, Dallas, Chicago and Houston. A tenth city, Orlando, has been added to the tour by national promoter Prria Haider Productions — a fitting finale for Kerala flood relief. Rahman had pledged, “We are striving towards mesmerizing you with never seen before visuals in the North America tour.” And he and his team delivered – performances, special effects and all! On stage, he was indefatigable doing what he knows and does the best: performing music. He was ever-present from start-to-finish of the three-hour concert in Hindi, Tamil and Telugu. He opened with an extended version of ‘Dil se re’ (Dil Se), showcased his versatility in the Punjabi number ‘Enna sona kyun Rab ne banaya’ (Ok Jaanu), easily transitioned to the Sufi style in ‘Kun faya kun’ (Rockstar), and rocked the stage in the grand finale to the beat of ‘Jai Ho’ (Slumdog Millionaire). “Music is universal, indefinable, and infinite. It is a feeling, a moment, an expression. It is harmony,” he says. Barot who has known Rahman for some 31 years recalled how they instantly became friends. “He is my friend and brother first, and music colleague second,” the music composer, drummer and singer told reporters at a press conference held two days before the Washington show. “I have maybe had thirty conversations with him” over three decades, he divulged. “That’s not his thing. He is only devoted to music, to the betterment of society through music. That is why there is a very different ethos in this show…. You become like family. We all serve a common purpose. There is no hierarchy.” For logistical reasons, everyone has there own act to perform, “but everyone is dedicated to doing their best work,” he said. Incidentally, the first track that Rahman-Barot collaborated on was the ‘Humma Humma’ song from the film ‘Bombay’. On stage at the EagleBank Arena, supremely gifted singer Narayan drew his fair share of applause enthralling the audience with superhit songs from films such as ‘Taal’, ‘Lagaan’ and ‘Dil Se’. 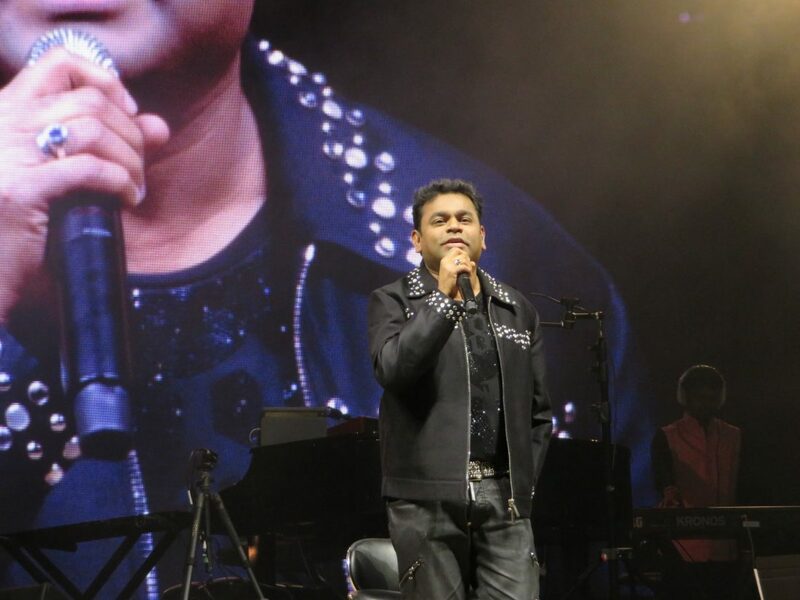 “I am very happy and excited to perform with the great AR Rahman sir. He has always loved me and given me the best songs,” he said at the presser. Mohan was a delight to behold on stage – pretty, petite and exceedingly talented. “Music takes me closer to God, so I chose this field,” she says. The first song she recorded with Rahman was ‘Jiya re’ from the film ‘Jab Tak Hai Jaan’. By her own admission, she couldn’t believe she was in the same studio as Rahman sir, lyricist Gulzar and director Yash Chopra. “It was a dream come true,” she told journalists. Speaking in Hindi, Ali revealed, “I came from such a place where I could never imagine that I would one day work with Rahman saab, or even enter the film industry. I used to listen to the songs of Udit-ji and Rahman saab and longed to work with them. When I came to Mumbai, I was very nervous when I got an opportunity to sing in Rahman’s studio.” But, he was immediately put at ease and didn’t feel like a newcomer, he said. “Rahman saab has an uncanny ability of recognizing talent and I was called to record a song.” The number was ‘Jashn-e-bahaara’ (Jodhaa Akbar) and it catapulted him to fame. Recalling his concert tour in 2016 under the ensign of Elite Bollywood Entertainment, Ali emphasized, “It was an incredible experience.” Warmly commending DC show promoter Taneja, he thanked him for his hospitality and providing a great deal of comforts to the artistes. “I was very happy to know that he is the promoter of our current show in Washington,” he told journalists. Gandhi disclosed, “I was discovered by Rahman sir on YouTube. He came across a cover of mine of a Christmas carol, and tweeted about it.” Soon after, she was invited to Chennai to record. “I still couldn’t believe what was happening,” she said about her experience. Swedish singer Lind met Rahman in 2014 when she went for an audition in a Los Angeles studio. Much to her delight, she was called to work with him the very next day. Lind admitted to being “very nervous on the tour. I don’t speak Hindi. I’m learning,” she said.